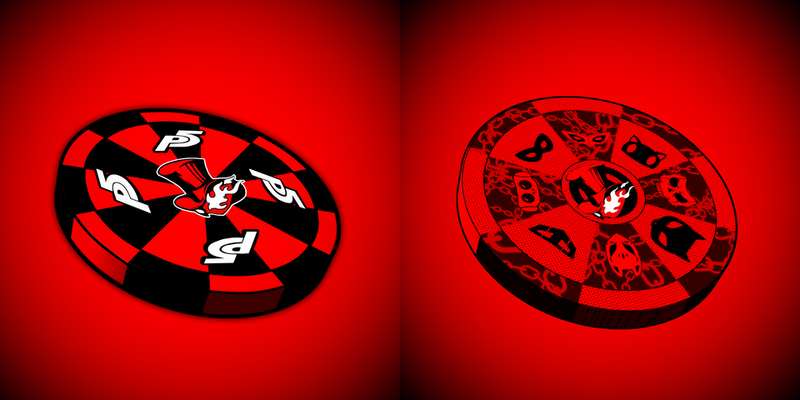 Reddit user AquaGleebis created some Persona 5 themed poker chip designs, which look straight out of a limited edition set in terms of detail and adherence to the thematic designs of Persona 5. AquaGleebis made two separate chips, the first which is a more simplistic one decorated with the P5 letter logo and distinctive Phantom Thieves logo. According to their post, they weren’t satisfied with that version so they set out to make a new, more detailed. The second chip design features every Phantom Thief members’ mask with their logo in the center. My favorite part of this chip is the interweaving of Arsene’s, the protagonist’s first and signature Persona, chains throughout the chip. Honestly I love both designs as they equally represent the unique aesthetics of Persona 5 well. Maybe Atlus Japan will pick them up and we’ll actually see them in a limited edition set someday. Or at the very least I would settle for a 3D printed version of the chips. This is hardly the first time fans came together for some very creative endeavors, including lovely fanart depicting a crossover of sorts between the Persona 5 ladies and Catherine, and some wonderful cosplay of both Futaba and Makoto. We also have some excellent Spiderman: Into the Spiderverse x Persona 5 crossover fanart, an amazing take on a GBA-styled version of the JRPG, and even an elaborate board game that fans can print out and play themselves. Those at DualShockers love Persona 5 as much as its very talented and devoted fanbase, judging by our glowing review of the title back in 2017.